Spring is here again, and with it comes spring cleaning – it’s time to roll up your sleeves, look into skip bin hire, and shed all the clutter you’ve gathered through the winter! When it comes to deep cleaning an entire home, it’s easy to get lost in the weeds. But, with a solid plan, you can make short work of the job without running out of steam. Today, we’ve put together five tips to help you make it through your spring clean in one piece. Before you can get at the harder to reach places, you need to clear yourself a path. Over the colder seasons, we tend to hang on to things rather than throw them out – a tendency that many people believe stems from the evolutionary drive to save resources to survive the winter. In modern society however, we often wind up saving things we don’t really need. If taking inventory of all your possessions seems daunting, try sorting things into piles. Make one pile for things you can still use, another for things you could donate to another home, and a third for things that are too worn out to be useful to anyone. Try to sort things on instinct! If you’re unsure where something should go, imagine your life without it, and if you don’t think you’d miss it, get rid of it! It will be worth it once your spring cleaning is done. It’s worth researching skips for hire at this stage in the process, for a few reasons. Firstly, chances are some of the things you need to get rid of are too big for the local garbage service to take. Broken sporting equipment, leftover building materials, damaged gardening tools, and defective appliances are all examples of items you may not be able to find another home for. Secondly, it’s important to try to tackle de-cluttering in one day, and this includes dealing with the final step in the process. If you sort out everything you want to throw away, make sure you follow through – putting this off will just result in a growing pile of rubbish on your property until next spring. Not ideal. Once you’ve successfully de-cluttered and removed everything you don’t need from the house, you can tackle cleaning. Before you go into your bathroom armed with a toothbrush, put together a cleaning kit to save time. Find something you can carry around the house easily, like an unused shower caddy, or a bucket, and fill it with all the cleaning supplies you need. This way, rather than going back and forth between each room and your laundry, you can just visit every room once. This may not sound like a huge time-saver, but you’ll be surprised at how easy it makes the process. While spring cleaning, remember that you’re not doing a quick once over. 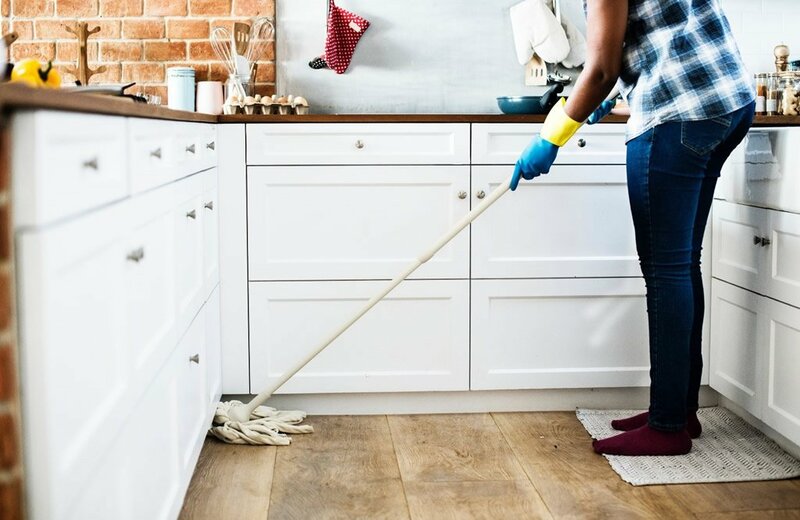 Since you’re doing a deep clean, you may as well get all the hard-to-reach places finished at once, so you don’t have to worry about them until next year! Places that are easy to forget about include the tops of ceiling fans, behind appliances, around your windows, and inside or on top of light fixtures. Only you know the layout of your home though, and you’ll find that once you start to think about where you haven’t looked in a long time, you’ll be spotting hidden places and mess everywhere. It’s important to make spring cleaning fun! Playing your favourite music is a great way to maintain your momentum, and turn an otherwise dull job into an excuse to enjoy yourself. If you live with others, like family or flatmates, find ways to make it a group activity, or even a competition if everyone is on board! Finally, it’s important to set goals. Hitting easy-to-achieve targets each day will make the process much smoother and enjoyable. Thinking what you need to do ahead of time can also help reveal problems early on – if you’ve forgotten that you loaned that ladder to a friend, for instance, planning helps you deal with it before starting, rather than being halted in your cleaning and having to track it down. Need a skip bin to help you shed some clutter? If you’re ready to dive into your spring clean, you’ll be looking to hire a skip bin. No matter where you are in the greater Auckland area, Bargain Bins can help you out. We offer skip bin hire North Shore, South Auckland, and everywhere in between. Talk to our friendly team today!